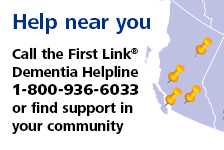 Help with memory loss | Alzheimer Society of B.C. Are you looking for ways to help your family member compensate for their loss of memory? This tele-workshop helps family caregivers identify strategies to help the person with dementia better cope with declining memory and preserve their independence. You will learn how simple adaptations to your routine and to the environment can help minimize frustrations for both you and your family member.